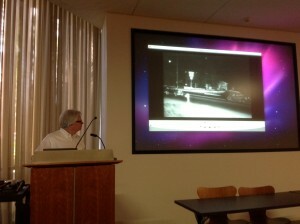 Last Friday, May 31, the UCLA Library welcomed collector, artist and archivist Rick Prelinger. Rick discussed his work and proposed provocative alternatives to existing modes of archival collection and access. His hour-long illustrated lecture was followed by a lengthy Q&A and was free and open to the public. It was presented by the UCLA Library in partnership with UCLA’s Moving Image Archive Studies program and Association of Moving Image Archivists Student Chapter, along with support from the UCLA Center for Digital Humanities, the Department of Ethnomusicology and the Ethnomusicology Archive, Melnitz Movies and the Department of World Arts and Cultures/Dance. The presentation was captured on video and will be posted on the Internet in a few weeks. In the meantime, the following are some highlights. 1. Why do we do what we do? Why do we keep what we keep? Are we collecting in the domain that we should? Is “collecting by chance” potentially a good collecting policy? 3.Personal records are a new frontier. How can we incorporate records of everyday people in collections? 4.Could we do archives like scientists do science? Test hypotheses against reality and use the scientific method! For example, perhaps complete preservation impact statements much like environmental impact statements. 5.How can we bring archival materials into common spaces? 6.What needs to happen remotely and what needs to happen on campus/at the library/archive? 7.How can we encourage users’ exploration? 1.Let users help us to see our collections in new ways and deepen our codependency on users to transform ourselves. 2.Reward projects that step outside of the box. 3.Permaculture principles thinking can aid the archival workflow to obtain yield and to "use edges and value the marginal", like regional archives. 4.Make archives DIY, local, open source, relational artworks, a social practice: not just to archive but to try to create a sense of community. With participatory spaces, workshops, archival research commons, etc. 5.Encourage transformative use. Rick showed an artist’s transformative use of AMERICAN THRIFT (1962) as a case study. 6.Home movie ethics: viewing is committing a sense of trespass. 8.Diversify the inputs that inform appraisal policy. For example, assemble a random panel of people who have a baseline of reading and writing skills and compare and contrast what they think we should we be saving. And make sure that these appraisal systems can learn over time. For more documentation of the event, also check out #aaaUCLA13 on Twitter for a record of attendees’ live tweets. Also last Friday, UCLA’s Melnitz Movies through the Graduate Student Association had a free and open to the public evening event featuring Rick Prelinger. It was a feature-length screening of footage from the Prelinger Archives, curated and contextualized live by Rick as well as audience members. He showed several home movies of Los Angeles, including beautiful color home movies of the UCLA campus in the 1940s and 1950s. The city of Los Angeles was also represented in several rear projection plates, which are films that were projected as the background of moving vehicles in Hollywood feature films. Lastly, Rick shared clips that he has screened at LOST LANDSCAPES: SAN FRANCISCO and LOST LANDSCAPES: DETROIT events, plus the full-length of Redbook Magazine’s IN THE SUBURBS (1957)and the beginning and end of LONG DISTANCE (1941).